Thanks to the involvement of many local businesses, Seaford Town Council has been able to work with a local publisher to produce an informative Town Map free of charge. 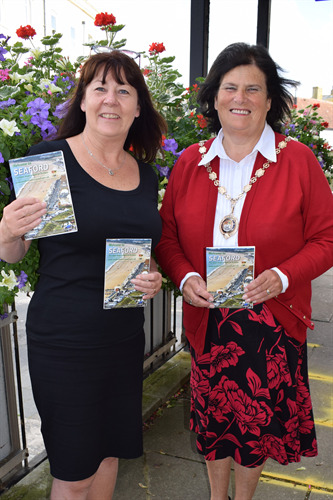 Staff at the Seaford Tourist Information Centre were delighted to receive a total of 5,000 copies to be given out to visitors needing to find their way around the town. Copies have also been distributed to the Tourist Information Centres in Lewes, Eastbourne and Peacehaven. As well as a street map of the complete town, a larger size map of the centre highlights important buildings and locations, including the position of the new defibrillators that were purchased as a result of the Young Mayor’s campaign last year. Editorial pages within the fold-out map include sections on The View and Seaford Head Golf Course, promoting these venues to visitors. There is also a helpful piece on The Seven Sisters and the Coastguard Cottages, which also includes a small route map from the seafront to the most advantageous viewpoint. Many visitors to the area are unaware that this famous sight is best seen from Seaford Head, rather than the Cuckmere Valley. A link to a digital version of the map can be found on the home page of www.seafordtowncouncil.gov.uk, enabling it to be enlarged. Advertisers’ own websites can be accessed by clicking on their displayed web addresses.